Egypt, Sudan, and Jihad are much in the news today. What follows is a brief overview of some of the history behind the news. We began with “Part I: The Mahdi’s world: Social and Political Conditions”. 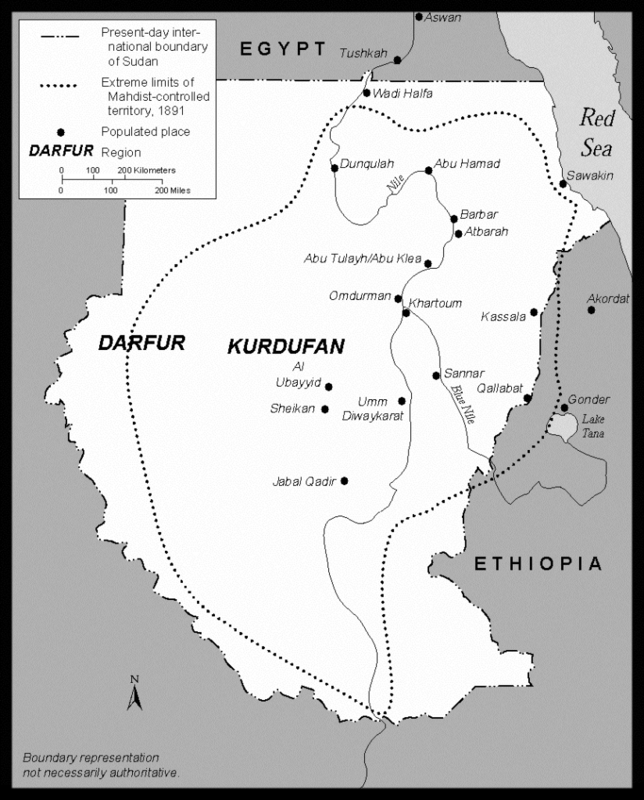 followed by Part II: The Mahdi’s World: Slavery, Bedrock of Sudan’s Economy. This is the third and final installment. This blog series was written by Judith Schaefer, volunteer in the Warren M. Robbins Library, National Museum of African Art. There are many signs that will precede him, a general and very important sign is that he will come at a time when there is great confutation, intense disputes and violent deaths. . . . The people will be troubled to such an extent that they will long for death. It is then that Imam Mahdi will be sent. Throughout the history of Islam, a few individuals — driven either by the desperate state of Muslims in their community or a selfish pursuit of power and prestige — laid claim to being Mahdi and found a following among the uninformed masses who were looking for salvation from the heavens. For some of these individuals . . . the claim to being Mahdi was just a stepping stone to the development of heretic sects which broke away from the fold of Islam. Thus, it is at least prudent to visit the facts of this prophecy and avoid falling prey to false claimants that will appear from time to time. False prophet or not, Muhammad Ahmad’s jihad against the “idolatrous” Turkiyya has had a lasting effect on the history of Sudan (now The Republic of Sudan and South Sudan). In South Sudan, he is still revered as the father of the country. Here is the story, very briefly. Again, the details are fascinating and complex, so do read more on your own. Africa, 1885 (just before the Partition of Africa among European powers). Perry-Castañeda Library Map Collection. “From the Scottish Geographical Magazine. Published by the Scottish Geographical Society and edited by Hugh A. Webster and Arthur Silva White. 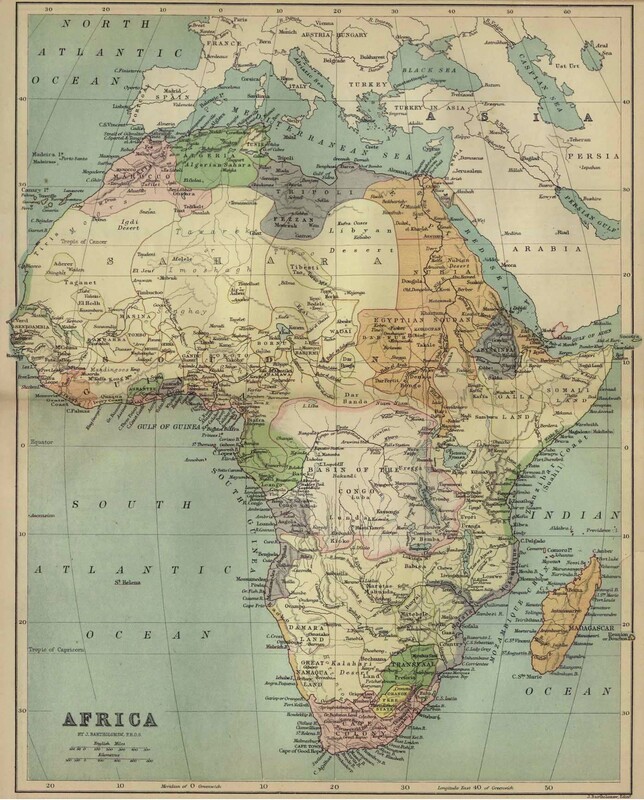 Volume I, 1885.” The image shows a political map with the knowledge about Africa in the year 1885, with a lot of ill-defined borders throughout the continent because the Scramble for Africa, the partitioning of Africa by the European powers has not yet really begun. Depicted on the map is the African continent at the end of the 19th century, in the then prevailing opinion that the last white spots of terra incognita has almost vanished from the maps of the Black Continent. First, an abbreviated, approximate timeline for Sudan. 641 A.D. The first of a succession of Arabian Caliphates conquered Egypt (a caliphate is a political entity governed by Islamic law and tradition); the region to the south, which they named Sudan (land of the Blacks) consisted of, in the north, three feudal, Christian kingdoms ruled by warrior elites; and, in the south, a vast region of many semi-nomadic tribes. 651 A.D. 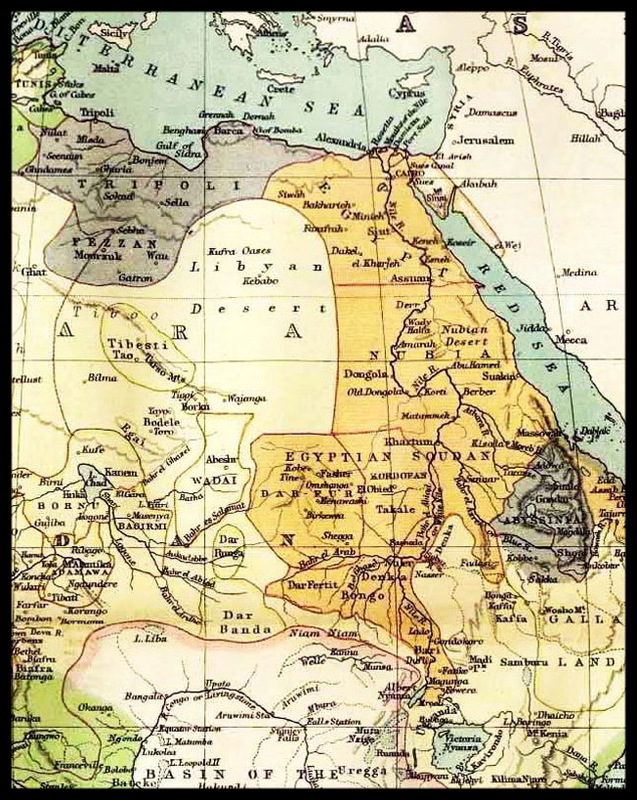 The Egyptian caliphate raided south as far as Dongola but met stiff resistance. 652-1330 A.D. Treaty of Al Baqt between Egyptian Caliphate and Christian kingdoms established relative peace between Nubia and Egypt. Islam gradually replaced Christianity through trade relations and favorable tax rates for Muslims. 1330 A.D. Islamic Mamluk (Egyptian) partial occupation of Sudan. 1504 A.D. Islamic Funj Sultanate replaced weakened Christian kingdoms. 1821 A.D. Turco-Egyptian caliphate invaded Nubia, end of Funj Sultanate and beginning of the Turkiyya. 1881 A.D. 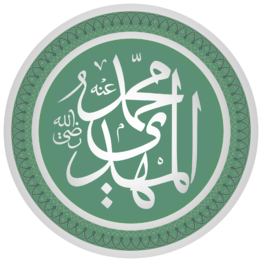 The Mahdi appeared, declared jihad against the Turkiyya. 1884 A.D. British forces enter the fray. 1885 A.D. Fall of Khartoum, Mahdi died, effective end of Turkiyya. 1885-1898 A.D. Mahdist state, jihad continued under the Khalifa. 1898 A.D. British defeated the Khalifa at Omdurman; British-Egyptian condominium government installed. The information was given that preaching will not purify the Turks; only the sword will purify them, save him to whom God shall grant grace. The Prophet informed me that the Muslim Community shall be guided by me without the difficulty that befell the Prophet and his followers, and that I am created from the light of the core of the Prophet’s heart. Mohammad Ahmad reporting a vision in which the Prophet spoke to him, July 1882. Know that I am the expected Mahdi, the successor of the apostle of god. I am the Mahdi, the Successor of the Prophet of God. Cease to pay taxes to the infidel Turks and let everyone who finds a Turk kill him, for the Turks are infidels. “The Mahdi.” Illustrated London News, May 10, 1881. The self-declared Mahdi, born Muhammad Ahmad, a Sufi of the Sammaniyya order, was born in Dongola, a town on the Nile, where his father built boats for a living. As a child, he learned the Koran by heart and could read and write Arabic. Young as he was, he impressed people by his piety. After an apprenticeship with a respected Sufi teacher, he began the life of a holy man–a spiritual guide and healer called fakir or dervish who could teach the Koran, write prayers for amulets, exorcise demons, even bring rain. In the upper Nile region these holy men were ubiquitous, but Muhammad Ahmad–a true charismatic–stood out from the pack. He set up a religious school on Aba Island, one hundred and twenty-five miles south of Khartoum, and soon attracted a wide following. Everywhere, the populace was on edge–seething with resentment of their corrupt and idolatrous governors and anticipating the end of the world–the long-promised millennium. Muhammad Ahmad saw his moment. Around 1880 he announced that he was the long-awaited Mahdi come to lead the people to rid Sudan of the idolatrous Turks and purify Islam. This likeness of the Mahdi, evidently the only one on record, shows a light-skinned Arab with an almost Christ like spirituality about him. It was drawn for the Illustrated London News by a well-known French artist and caricaturist with little reliable information to go on. What did the Mahdi really look like? His outward appearance was strangely fascinating; he was a man of strong constitution, very dark complexion, and his face always wore a pleasant smile, to which he had by long practice accustomed himself. Under this smile gleamed a set of singularly white teeth, and between the two upper middle ones was a V-shaped space, which in the Sudan is considered a sign that the owner will be lucky. His mode of conversation too had by training become exceptionally pleasant and sweet. As a messenger of God, he pretended to be in direct communication with the Deity. All orders which he gave were supposed to have come to him by inspiration, and it became therefore a sin to refuse to obey them; disobedience to the Mahdi’s orders was tantamount to resistance to the will of God, and was therefore punishable by death. The rebellion which followed the appearance of the Fakir Mohammed Achmed as Mahdi was the result of such small beginnings that at the time they were allowed to pass unnoticed, and even in Khartoum itself they were thought to be of little consequence. Extraordinary financial mismanagement and gross tyranny of the Egyptian satraps were the means of gradually developing an insurrectionary spirit among the people, that broke out into open resistance on the rise of the Mahdi. For he claimed to be the Prophet, who, according to an old tradition, was destined to appear at the beginning of the fourteenth century after the Hegira, to revive the splendor of Islam and to complete its conquest of the world. Richard Buchta, The True Story of the Rebellion in the Sudan. Such insolence demanded action. Immediately, Raouf Pasha sent troops—unfortunately poorly led and disorganized– to take him by force. The Mahdi’s men, armed only with sticks, swords, and spears, ambushed the hapless bunch—only a few escaped alive. The Mahdi, satisfied, then carried out his initial plan to migrate with his followers to Kordofan, in the desert west, a region already up in arms after the defeat of the slave traders (see Part II). From then until the end of 1882, clashes led to skirmishes which led to more open warfare, with some losses but more victories bringing with them great wealth–foreign arms, slaves, livestock, goods, and money. Even better, the ranks of his followers swelled. The Mahdi called them Ansar, “helpers,” a term used by the Prophet at Medina for his own supporters. The Mahdi claimed that each victory proved that God was on his side, and tribesmen all over Sudan believed him and joined up. He announced that Egypt would be next, then Baghdad, and eventually the whole world would fall before his armies. With an army now of some ten thousand men, he attacked and laid siege to El Obeid, the provincial capital of Kordofan. After bitter fighting and a murderous siege, he entered the city as conqueror on January 19, 1883, dressed in yellow silk and wearing a green prophet’s turban—fine clothes indeed for a pious ascetic. A disastrous loss for the Turkiyya, this was, one that would not go unchallenged. 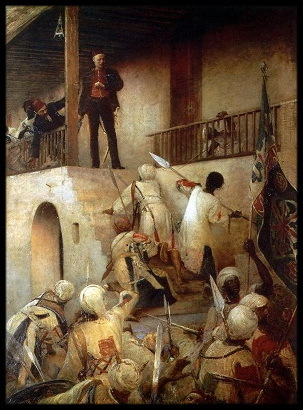 The Khedive soon sent an army led by the British soldier Colonel William Hicks to retake the city and destroy the Mahdi’s power. On November 5 of that year, on the outskirts of El Obeid, the Hicks army was annihilated (see Part I). Now, with much of western Egyptian Sudan under his control, the Mahdi set his sights on Khartoum, capital of the Turkiyya in Sudan, a city of some 34,000 troops and civilians, including many foreigners there on business or attached to one of the many consulates—British, Austrian, French, Italian, Persian, and others. What happened next has passed into legend. Rudyard Kipling’s extremely popular first novel, The Light that Failed, 1898, has as a backdrop the British campaign to save Khartoum. A Broadway play (1903) and two silent films (1916, 1923) were based on the novel, and in 1939, The Light that Failed, starring the great Hollywood stars Ronald Colman, Walter Huston, and Ida Lupino, was a huge hit. In 1966, yet another version appeared, Khartoum, starring Charlton Heston as Gordon and Lawrence Olivier as the Mahdi. A radio drama based on The Light that Failed is still available online. “General Gordon’s Last Stand.” George W. Joy, 1893. Courtesy Leeds Art Gallery, Leeds Museums and Galleries . Gordon was reported killed on a stairway in his palace. He heard them coming, took up his weapons, and stepped out of his study to meet them. There is not enough space here to describe the horrors of the siege of Khartoum and the botched rescue attempt, sent reluctantly and too late by Prime Minister Gladstone—a mistake that cost him his job. Gordon Pasha, now Governor-General of all Sudan, paid more dearly. At the last minute he offered the Mahdi, whose army had menaced the city for months, the Sultanate of Kordofan, remission of taxes, and permission to own personal slaves if he would call off his rebellion. The Mahdi rejected this desperate gamble and made a counter offer: convert to Islam and be saved. Gordon, a Christian idealist, refused. The city fell in January 1885, and Gordon’s handsome, blue-eyed head was sent to the Mahdi at his headquarters in Omdurman, only seven miles away. There it was displayed in a tree for all to see. Five years before, Gordon, had written from Darfur, “The government of the Egyptians in these far-off countries is nothing else but one of brigandage of the very worst description. It is so bad that all hope of ameliorating it is hopeless.” Events, sadly, proved him correct. The Mahdi died suddenly a few months later, leaving behind his four wives, a modest harem of thirty women (the Khalifa, his successor, had some three hundred in his), vast wealth looted from Khartoum, and the Turco-Egyptian order in tatters. But the British army, with its superior weaponry, had now entered the war. For thirteen more years the Khalifa would lead the Mahdist forces in wave after wave of conquest, of bloody death and appalling cruelty, of unforgettable horror, mass enslavement and the destruction of whole villages all across Sudan. Eventually the Mahdiyya controlled a region nearly the size of western Europe and threatened to invade Egypt next. “The Mahdist State, 1881-98.” Note different spelling of place names, e.g. Al Ubayyid = El Obeid. 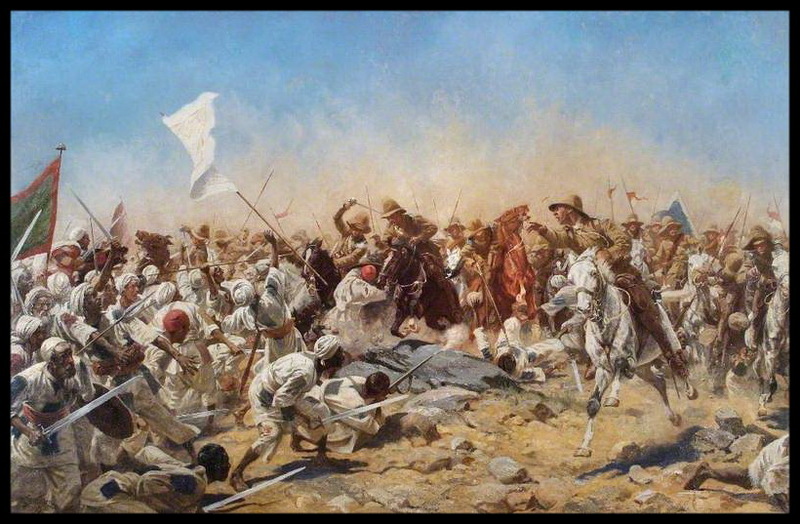 The end came in 1898 at the battle of Omdurman (called in some accounts the battle of Karari, a town 6.8 miles north of Omdurman). The British public had long demanded that Gordon’s death be avenged, and the government was increasingly concerned about its precious short-cut to the East–the Suez Canal. Around 1885, Major-General Sir Hubert Kitchener, already in Egypt as Commander of the Anglo-Egyptian army, received orders to prepare for a final assault. He had to first build rail and steamship supply lines from Cairo to Sudan and train his troops—8,200 Britons (among them Lt. Winston Churchill, also a war correspondent for The Morning Post); and 17,000 Egyptian and Sudanese (many of the Sudanese were deserters from the Mahdist army or had been taken from it as prisoners). This arduous and costly preparation took more than two years. About 4 miles away to the half right, was what appeared to be a long zariba, or thorn fence, with men behind it. At about 11am, as the Sirdar’s cavalry watched the zariba, it began to move towards them, and the cavalrymen realized that, what they had taken as a fence, was in fact a 4 mile long wall of armed warriors, now hurrying towards them. This advancing army was topped by a sea of flags. Horsemen rode along the line. A deep murmur of thousands of voices was to be heard, with horns and drums playing. There appeared to be around 55,000 men, moving in 5 great divisions. The next day, the Khalifa’s army attacked Kitchener’s position, and five hours later, some 11,000 dervishes (as the Mahdist troops were called) lay dead; another 16,000, lay wounded on the battlefield. What had happened? The British, although outnumbered more than two to one, had the advantage of modern weapons–the murderous, recently invented Maxim machine guns carried the day. The dervishes’ weapons–aging Remingtons and ageless swords and spears—were no match for this cunning new invention. The Anglo-Egyptian army suffered 47 deaths and 382 wounded. The Khalifa and a few attendants fled the city on donkeys, managed to meet up with part of their army, and withdrew to a stronghold in Kordofan. The British learned of his whereabouts in October 1889 and sent an army under General Sir Reginald Wingate to find him. The subsequent battle, on November 25, was violent and brief. The Khalifa realized that the situation was hopeless and sat down on his sheepskin to await his fate. He was found dead lying on it. “Flag, Mahdiyya State, Sudan, 1882-1885.” National Museum of African Art. The armies were divided into three sections, each headed by one of the three Khalifas. Each had its own flag—one green, one red, and one black. The black one belonged to the largest army, the one headed by the Khalifa, the man who would succeed the Mahdi. The image shows a red one: the brownish, central silk panel is surrounded by cotton borders, one blue-black and the outer one, red. The appliqué inscription is a religious text. Note: the background is black, not the flag itself. The Mahdist regime comprised three main elements: the high command, the financial basis, and the judicial system. The Mahdi was the supreme ruler, of course, and his immediate subordinates—three khalifas and various kinsmen—had to swear an oath of allegiance and obedience, which included promises not to steal or commit adultery. Finances involved wealth management and taxation. The Mahdi set up a treasury and decreed that all booty was the property of the community and, as Sharia stipulated, would be distributed based on need—one-fifth to the Mahdi himself and the rest, in theory, divided among the warriors; in fact, most of it ended up in the treasury. Sharia-based taxes, called Zakat then and now, were levied on grain and cattle and would also be distributed to the weak, the poor, the warriors, and the party of God. After the conquest of Khartoum, which yielded huge quantities of gold and silver among other booty, the Mahdi set up a mint. The silver dollars and gold pounds it issued turned out to be worth more than their face value, and they soon disappeared from circulation. The Khalifa avoided this problem by minting coins with increasingly less silver and more copper. Eventually merchants began to refuse to use this debased currency, and the decree went out that such offenders would have their property confiscated and lose a hand or foot. Merchants responded by simply adjusting prices for goods based on the type of currency offered. People who paid in the Khalifa’s coins had to pay more. The purpose of the judiciary was to revive the faith and customs of the Prophet and to do away with Sudanese customs not in keeping with Sharia. The Mahdi was the supreme authority; his decisions, divinely inspired, were based on texts in the Koran and the Hadith. Emergency legislation, enacted to restore order to a society in turmoil, governed land ownership and the status of women, the former because of confusion over whose statutes to honor—Egypt’s or his own, and the latter because women needed protection. For their own good, they were not to go unveiled and were forbidden to go to market places or into public streets (one hundred lashes), nor could they go out with the herds, because they might meet strange men. A man caught speaking to a strange woman had to fast for two months and got one hundred lashes. There were also laws against wearing amulets and the excessive wailing of women at funerals, and expenditure for weddings was limited to $10 if the woman was a virgin and $5 if she had been married before. Drinking wine got a man eighty lashes and smoking tobacco, one hundred. Rules for marriage were designed to prevent Muslims from marrying non-believers. Propaganda was crucial to keeping the enterprise cohesive. Initially, the Mahdi himself sent a stream of warning letters to unbelievers announcing that the Prophet had declared him to be the Mahdi who would lead the jihad. Then he sent many letters to followers spelling out his divine mission in some detail and admonishing them to obey him and Sharia law. For the illiterate masses, he hired panegyrists to compose praise poems bearing the same message of jihad and religious reform. They were chanted and sung nightly around every Mahdist campfire, to the sound of drumbeats and cries of enthusiasm. Later, during the Khalifa’s rule, propaganda pamphlets were printed on a lithograph press set up at the Mahdist capital, Omdurman. The symbolism of uniforms was important. Initially all soldiers, including the Mahdi, wore ragged, patched cotton tunics like the bottom left, emblematic of the Sufis’ ascetic way of life and vow of poverty. “Tunic, Mahdiyya State, Sudan, 1882-1898.” National Museum of African Art. But as wealth from many victories flowed into the Mahdi’s treasury, a taste for luxury developed: many of the emirs and sheiks began to live like the Egyptians they despised. The Mahdi deplored this trend but, according to reports, was not immune to it himself. One result, gorgeous tunics like one above right were designed and even worn in battle. The patches are still there, but as elements of sophisticated design and meticulous workmanship. “The defeated leader of the Sudanese (Dervish) forces at the Battle of Atbara, April 8, 1888, Emir Mahmoud, is interrogated by Director of Intelligence, Colonel Sir Francis Wingate, after being captured.” Christopher Spring, Beyond the Loom, Washington, DC:1999. 100.
Who joined the Mahdist army? His first group of followers were inspired by the religious call to purify Islam, but others soon joined for various reasons: the displaced Arab slave traders and their private armies from the Bahr al-Ghazal (see Part II) were angry that the trade was now forbidden; and most of Sudan’s hundreds of ethnically and linguistically diverse tribes—cattle keepers and farmers, village dwellers, semi-nomads, and nomads–Baqqara, Dinka, Shilluks, Bara, the Red Sea Arabs, to name just a few—resented the harsh rule of the Turco-Egyptian government. The movement also attracted anarchists, malcontents, runaway slaves, men seeking adventure and booty, and criminals on the lam—even a brigade of Irish revolutionaries from Chicago hoped to take part, not because they loved the Mahdi but because they so hated the British. The Irish Brigade accepted only men who had fought for either the Union or the Confederacy in the recently ended Civil War. 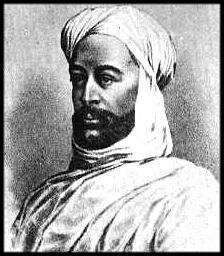 To many modern Sudanese Muhammad Ahmad al-Mahdi is the father of nationalism. The view of the Mahdist movement as being nationalist in origin has come about because it throve upon the unity created by the oppression of the Turco-Egyptian regime; and also because the Mahdi managed to overcome, perhaps for the first time, the system of tribal and religious loyalties, to allow the Muslim Sudanese people to act as one with a common motivation and a common loyalty. Even so, whatever authority the Khalifa had exercised continued to rest upon brute force and reverence for the late Mahdi, something which obliged him to continue all the initiatives undertaken by his predecessor, including a campaign of Jihad against Egypt (since 1882 occupied by British forces) and against Ethiopia in order to bring its ‘infidel’ people into Islam. He also sent dispatches to queen Victoria, the Ottoman Sultan Abd al Hamid and Kedive Tawfiq of Egypt enjoining them to submit to Mahdiyya. This obscurantist approach to international relations, with its concomitant adventurism, had contributed more than anything to the demise of the regime. Tribal feuds, internal dissension and famines compounded matters further for the Khalifa; the only surprise, thereafter, was that the Mahdist regime survived as long as 1898 when its fate was sealed by the victory of Kitchener’s superior army at the battle of Karari [Omdurman]. Professional historians will debate whether or not the Turkiyya from 1820 to 1881, the Mahdiyya from 1881 to 1898, the Anglo- Egyptian Condominium from 1898 to 1956, and the state of independent Sudan from 1956 to 2011, had similar policies of oppression, making the people of South Sudan view all of them as one continuum of colonization. Ever since the country we now knew as the Sudan came into existence, the people living in its southern half have had important shared historical experiences ranging from their contact with the outside world and the effects of slavery, several eras of colonialism, and the protracted wars they experienced in the process of secession from Sudan. This narrative is now South Sudan’s state history, the official conclusion that, united or not, this new country was once a colony of each of these powers, and has only just ended a prolonged period of foreign rule. However one looks at it, the human toll was catastrophic: It is estimated that the population of Sudan fell from seven million before the Mahdist revolt to between two million and three million after the end of the Mahdist era. . . . The Mahdi gave a vision of the possibility of a sovereign state but also generated deep internal division, intertribal warfare, and general domestic turmoil. 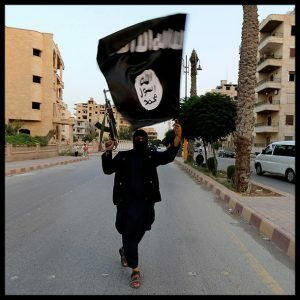 “How Many Foreign Fighters Have Joined ISIS?” Anna Altman, 9/16/2014. Photo via Reuters. The Mahdist jihad underlies much of the ongoing violence in South Sudan and seems to inspire today’s ISIS: current photos from the Middle East show men brandishing weapons and waving flags bearing religious inscriptions just as the Mahdists did. It can be said that the first jihad was the one that established Islam in the 7th century, and rebellions to purify the faith have erupted many times over the centuries. For more recent examples, there were four jihadist states in early nineteenth-century West Africa. It appears that today’s news is not really new at all. Anthony, Jack. 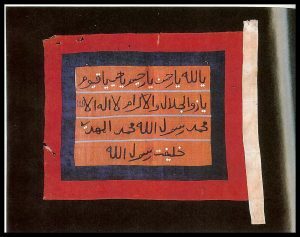 “Banner of the Mahdiyya, 1885-1898.” Africa: Relics of the Colonial Era, 8-9. London: Michael Graham-Stewart, 1991. Buchta, Richard. The True Story of the Rebellion in The Soudan By One Who Knows the Mahdi Personally, London: Abraham Kingdom, 1885. A translation by Mrs. F. W. Felkin of Der Sudan und der Mahdi; das Land, die Bewohner und der Aufstand des falschen Propheten, by Richard Buchta, Stuttgart:J. G. Cotta, 1884. Gray, Richard. “The Southern Sudan,” Journal of Contemporary History, 6 (1971) 109-110. Holt, P. M. The Mahdist State in the Sudan, 1881-1898: A Study of its Origins, Development, and Overthrow. Nairobi, Oxford University Press, 1977. Second Edition. Ohrwalder, Father Joseph. Ten Years Captivity in the Mahdi’s Camp, 1882-1892. Trans. F. R.Wingate. Facsimile of the 1st ed. published London: Sampson Low, 1892. London: Darf, 1986. 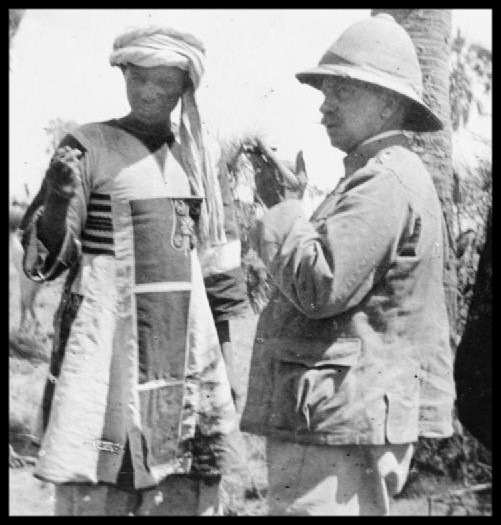 Slatin, R. C. Fire and Sword in the Sudan. Translated by R. Wingate. London: Edward Arnold, 1896. Spring, Christopher. 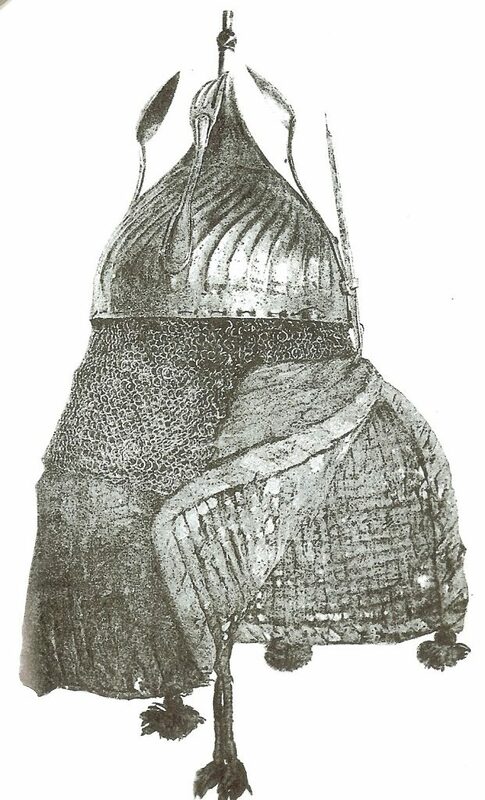 African Arms and Armor. Washington, DC: Smithsonian Institution Press, 1993. Thomas, Frederic C. Slavery and Jihad in the Sudan. Bloomington, IN. : iUniverse, 2009. Wingate, Mahdism and the Egyptian Sudan, 13. Wingate, Ten Years Captivity, 14. Note that Kipling writes here in the voice of an ordinary British soldier expressing admiration for the enemy. they call them “eathens,” but remember that the Mahdists called anyone who wasn’t a mahdist an ‘infidel,” threfore deserving of death. The cultural bias was mutual.